SOX7 is a transcription factor belonging to the SOX family. Its role in lung cancer is unknown. In this study, whole genomic copy number analysis was performed on a series of non-small cell lung cancer (NSCLC) cell lines and samples from individuals with epidermal growth factor receptor (EGFR) mutations using a SNP-Chip platform. SOX7 was measured in NSCLC samples and cell lines, and forced expressed in one of these lines. A notable surprise was that the numerous copy number (CN) changes observed in samples of Asian, non-smoking EGFR mutant NSCLC were nearly the same as those CN alterations seen in a large collection of NSCLC from The Cancer Genome Atlas which is presumably composed of predominantly Caucasians who often smoked. However, four regions had CN changes fairly unique to the Asian EGFR mutant group. We also examined CN changes in NSCLC lines. The SOX7 gene was homozygously deleted in one (HCC2935) of 10 NSCLC cell lines and heterozygously deleted in two other NSCLC lines. Expression of SOX7 was significantly downregulated in NSCLC cell lines (8/10, 80%) and a large collection of NSCLC samples compared to matched normal lung (57/62, 92%, p= 0.0006). Forced-expression of SOX7 in NSCLC cell lines markedly reduced their cell growth and enhanced their apoptosis. These data suggest that SOX7 is a novel tumor suppressor gene silenced in the majority of NSCLC samples. Lung cancer is the leading cause of cancer-related death in the world. If surgery is inadequate, further therapy is rarely curative. Understanding the genomic abnormalities in this disease affords the opportunity to identify new therapeutic targets. An example is the use of Gefitinib for patients whose non-small cell lung cancer (NSCLC) has an epidermal growth factor receptor (EGFR) mutation in either exon 19 or 21. SOX7 is a member of the SOX (SRY-related high mobility group box) transcription factors . This protein, together with SOX17 and SOX18, comprises the SOX F subgroup  and helps mediate various developmental processes including a role in the regulation of hematopoiesis , cardiogenesis , vasculogenesis [5, 6], endoderm differentiation  and myogenesis . Recently, SOX7 has been proposed to function as a tumor suppressor in colorectal and prostate cancers [9, 10]. We provide evidence that SOX7 behaves as a tumor suppressor in lung tissue and its expression is either low or silenced in the majority of lung cancers. Ten human lung cancer cell lines (H23, H460, H820, H1299, H1975, HCC827, HCC2279, HCC2935, HCC4006, PC14) were cultured in RPMI medium with 10% FBS and kept in a humidified atmosphere of 5% CO2. After IRB consent, total DNA and RNA of normal and cancerous lung tissues were obtained from the National University of Singapore (NUH-NUS Tissue Repository). Also, sixty-two pairs of primary NSCLCs and their corresponding adjacent normal tissues, which were at least 5 cm away from the cancer, were obtained from NSCLC patients treated at Shanghai Chest Hospital (Shanghai, China), after their written informed consent. None of the patients received radio-chemotherapy prior to obtaining the tissues. Lung cancer cells stably expressing either GFP or SOX7 were generated by transducing them with PLKO.1 lentiviral vector system (Sigma). Briefly, cells were transduced with lentiviral vectors (SOX7 or GFP) at an MOI of 25 with 5 ug/ml polybrene added for 6 h. Twenty-four hours post-transduction, stable cells were selected using 1ug/ml puromycin for 2-3 weeks. Genomic DNA from NSCLC cells were subjected to GeneChip Human mapping (1000 K array for the EGFR mutant lung cancer samples and 250 K array for the NSCLC cell lines). Both total and allelic-specific copy numbers (CN) were determined using CNAG software [11, 12]. Real-time reverse transcriptase polymerase chain reaction (RT-PCR) was performed using Maxima® First Strand cDNA Synthesis Kit for RT-qPCR (Fermentas) according to the manufacturer’s protocol. The expression level of SOX7 mRNA in the samples was determined by quantitative real-time PCR (7500 Fast Real-Time PCR System, Applied Biosystems) using KAPA™ SYBR® FAST qPCR Kit Master Mix (2X) Universal (Kapa Biosystems). Levels of β-actin mRNA were used as an internal control. The delta threshold value (DCt) was calculated from the given threshold (Ct) value by the formula DCt = (Ct SOX7 – Ct β-actin) for each sample. NSCLC cells were lysed with ProteoJET™ Mammalian Cell Lysis Reagent (Fermentas). Immunoblotting was performed using either anti-SOX7 antibody (Sigma, HPA009065) or anti-β-actin antibody (Sigma, AC-15) and either secondary anti-Rabbit IgG antibody (GE Healthcare, NA934) or anti-murine IgG antibody (GE Healthcare, NA931), respectively. SOX7 or β-actin bands were detected using Pierce® Fast Western Blot Kit, SuperSignal® West Femto Substrate (Thermo SCIENTIFIC) and SuperSignal® West Pico Chemiluminescent Substrate (Thermo SCIENTIFIC), respectively. PCR products were cloned into either the pGEM-T or pGEM-T easy vector (Promega), and at least four clones from each sample were sequenced. H23 and H1975 cells were seeded at 5 × 103 per well in 96-well plates. H1299 cells were seeded at 1.5 × 103 per well in 96-well plates. MTT reagents were added to each well, and absorbance was measured according to the manufacturer’s instructions (Promega). 2x106 cells stably expressing either SOX7 or GFP were seeded into 6-well plates for 24 h. Cells were harvested and washed twice with cold phosphate-buffered saline (PBS) and fixed in 75% ethanol (precooled at -20°C) for 24 h at 4°C. The fixed cells were washed twice with 2 ml of cold PBS. Cells then were stained with 500 ul of propidium iodide (PI) staining solution (50 ug/ml PI, 0.1%Triton X-100, 200 mg/ml DNase-free RNase in PBS) for 30 min at room temperature in the dark. Ten thousand events per sample were acquired using a LSR-II flow cytometer (Becton-Dickinson, San Jose, CA, USA), and the percentage of cells in G0/G1, S, G2/M and Sub-G2/M phases of the cell cycle were determined using FACS DIVA software (Becton-Dickinson). 4× 105 cells were seeded into each well of a 6-well plate for 48 h. The staining was carried out according to the instructions provided by the manufacturer of PE Annexin V Apoptosis Detection Kit I, BD Pharmingen (BD Biosciences, USA). Briefly, cells were washed with PBS, suspended in 1X binding buffer and then added with annexin-V APC and propidium iodide (PI) for 15 min. The samples were then analyzed by LSR-II flow cytometer (Becton-Dickinson, San Jose, CA, USA). Initially, genomic alterations were examined in a small sample set of Asians with NSCLC with EGFR mutations. Nine clinical NSCLC samples with EGFR mutation were analyzed for copy number aberrations (CNA) using a high-resolution SNP-Chip microarray platform (Affymetrix). The alterations of the CNA in these mutant EGFR samples were compared to 56 NSCLC samples from The Cancer Genome Atlas (TCGA) data base. The mutational status of EGFR in these 56 NSCLC samples is not available; but because most of the patients are Caucasians from the USA, the EGFR in the NSCLC probably is mutated in less than 7% of these cases . The overall genomic profiles of NSCLC were highly similar when comparing our samples having a mutant EGFR and the samples in the TCGA data base (Figure 1A; Table 1). This is consistent with our earlier study where we reported this observation across a larger cohort . For example, 78% (7/9) and 75% (42/56) of samples of both cohorts had gain at 5p13.2, and 67% (6/9) and 73% (41/56) of samples had gain at 8q24.12-24.3, respectively. Nevertheless, several CNAs were associated with the EGFR mutation-positive NSCLC samples (Table 2). For example, 89% (8/9) of our EGFR mutant tumors versus 27% (15/56) of the TCGA samples had CN gain at 1p36.31-36.32; also, 56% (5/9) of our EGFR mutant samples versus 11% (6/56) of the TCGA samples had gain at 19q12. Clearly, too few EGFR mutant samples were analyzed to perform statistical analysis. We also did SNP analysis on 8 EGFR mutant NSCLC cell lines. These cell lines frequently had CN gain throughout much of each chromosome (Figure 1B). Loss of CN in the NSCLC samples and cell lines was infrequent, occurring slightly more often at 6q22.3-27, 8p, and 9p21.3 (Figure 1A, B; Tables 1, 2). Whole genome copy number analysis using high resolution SNP-Chips . (A, B) Heat map of DNA copy numbers found in the p and q arms of the chromosomes (horizontal axis) of 56 NSCLC samples from the TCGA data base [top panel, Figure 1A], 9 NSCLC patient samples with EGFR mutations [bottom panel, Figure 1A] and 8 NSCLC cell lines with EGFR mutations [Figure 1B] (vertical axis). DNA copy numbers are indicated by colors (black, blue, green, pink, orange and red are 0, 1, 2, 3, 4 and ≥5 copies, respectively). Common copy number gain regions are emphasized by red dotted rectangles. Common copy number loss region is emphasized by blue dotted rectangle. (C) At chromosome 8p23.1, a homozygous deletion of SOX7 occurs in the HCC2935 NSCLC cell line. Red dots show raw data. Blue line denotes total gene dosage by CNAG; level 2 indicates diploid (2N) amount of DNA. Sample is mostly hemizygous. Green small vertical bars immediately under the chromosome display heterozygous SNP sites. The bottom lines (Red and Green) denote allele-specific gene dosage (one line indicates gene dosage of the maternal allele, and the other indicates gene dosage of the paternal allele). Sample shows that chromosome 8 is hemizygously deleted except at 8p23.1 where the second allele is also lost in a small region resulting in homozygous deletion of the UNQ9391, RP1L1 and the SOX7 genes. Common genomic alterations found in both NSCLC samples with EGFR mutations (9 samples) and those from the TCGA data base [56 samples, probably these rarely have an EGFR mutation (Zhou et al. )]. Ratio of genomic alterations in NSCLC samples with EGFR mutations (9 samples) and 56 NSCLC samples from the TCGA data base. [Most samples from TCGA are from Caucasians and thus we assume <7% will have EGFR mutation as previously noted (Zhou et al. )]. Cell lines enhance the opportunity to discover homozygous deletions because they are not contaminated with normal cells. A homozygous deletion often marks the position of a tumor suppressor gene that may be deleterious for either development or progression of cancer. A small homozygous deletion at 8p23.1 was found in one (HCC2935) of 10 NSCLC cell lines. The SOX7 was located in this small homologously deleted region together with 2 other genes (UNQ9391 and RP1L1) (Figure 1C; Table 1). Expression of SOX7 gene was examined initially in 10 human NSCLC cell lines using quantitative RT-PCR (qRT-PCR). Compared with the average SOX7 mRNA level (arbitrary level 1) of five normal lung tissues, nine of the 10 cell lines exhibited extremely low levels of SOX7 mRNA (mean level was 12% of the average found in the normal lung tissues) (Figure 2A). In addition, SOX7 protein expression was only weakly detected in two (H460 and PC14) of these 10 NSCLC cell lines (Figure 2B). Down-regulation of SOX7 in NSCLC cells . (A) Real-time reverse transcription-PCR measurement of expression of SOX7 mRNA in 10 NSCLC cell lines and 5 normal lung samples. Relative expression level 1.0 represents the mean expression of the 5 normal lung tissues. (B) Western blot analysis of SOX7 expression of the same 10 NSCLC cell lines. β-actin is used as the loading control. (*) denotes EGFR mutated cell lines. Next, a large number of clinical NSCLC samples were examined for expression levels of SOX7 mRNA in 62 pairs of tumors and their matched normal lung tissues using qRT-PCR (Figure 3A). Paired T-test analysis showed that the expression of SOX7 mRNA was significantly decreased in fifty-seven of 62 (92%) NSCLC samples compared with adjacent normal lung tissues (p= 0.0006) (Figure 3B). The correlation between SOX7 mRNA levels, and clinical as well as pathologic characteristics was analyzed (Figure 3C). 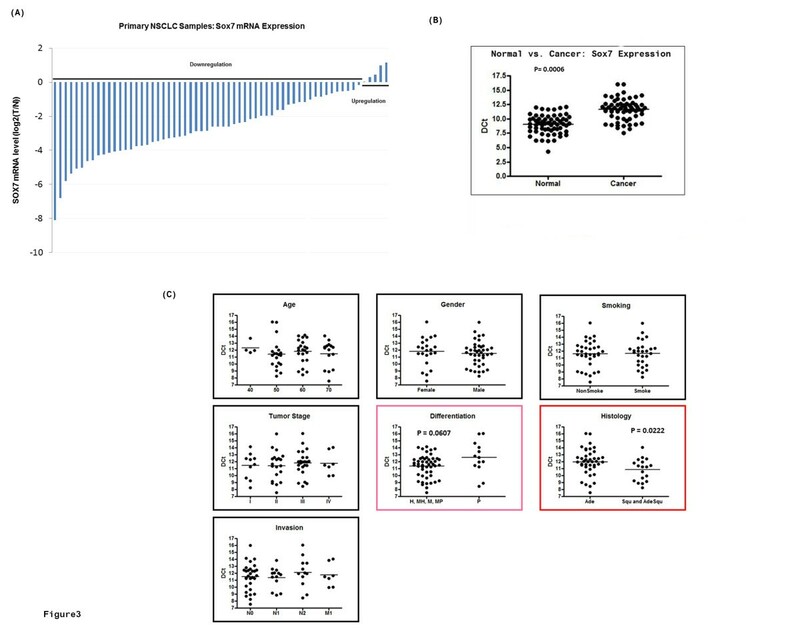 Expression levels of SOX7 mRNA were correlated with histology (adenocarcinoma had lower expression than either squamous or adenosquamous carcinoma, p= 0.0222) and tumor differentiation (poorly differentiated had lowest expression, p= 0.0607). In contrast, no significant correlations were identified between SOX7 expression in the NSCLC and age, gender, smoking history, tumor stage and invasion (Figure 3C). Downregulated SOX7 in NSCLC compared to matched normal lung samples . (A) Waterfall graph showing SOX7 mRNA expression in 62 paired human NSCLCs compared to normal lung tissue from the same patient. SOX7 mRNA expression was normalized to β-actin mRNA. (B) Statistical analysis of SOX7 mRNA expression in 62 paired human NSCLCs and normal lung tissues. Delta threshold cycle value (DCt) was calculated from the given threshold (Ct) value by the formula DCt = (Ct SOX7 – Ct β-actin) in each sample. P value was calculated with Paired T-test. (C) Relationship between significant SOX7 mRNA levels in the NSCLC samples and clinicopathological features of the patients and their NSCLC. Statistical differences were observed in histological differences (p=0.0222). The p values were calculated with Mann–Whitney T-test. The mechanism underlying the down-regulation of SOX7 expression in lung cancer was explored. The upstream region of SOX7 gene has several dense CpG islands (Figure 4A). Primers for Bisulfite Sequencing and Methylation Specific PCR (MSP) assays were designed (Figure 4A). Bisulfite Sequencing analysis showed that the upstream CpG rich region (-687 to -440) was hypermethylated in all 7 of the examined NSCLC cell lines. The downstream region (-71 to +251) was hypermethylated in two (H1975 and HCC2279) of 9 NSCLC cell lines (Figure 4B). MSP analysis confirmed the Bisulfite Sequencing technique, showing that the upstream region (-683 to -493) was highly methylated in eight (H23, H460, H820, H1299, H1975, HCC827, HCC2279, PC14) of the 9 NSCLC cell lines (Figure 4C and Table 3). As expected, we could not amplify either the upstream or downstream regions of the SOX7 gene in the HCC2935 cells consistent with a homozygous deletion of the gene in these cells (data not shown). A perfect correlation between upstream methylation and SOX7 expression did not occur. HCC4006 had only modest positivity by MSP but did not express SOX7; and PC14 was methylated by MSP examination, but expressed SOX7. Also in contrast to the cell line data, the Bisulfite Sequencing analysis showed that the upstream region (-687 to -440) was hypermethylated in one of 5 lung tumor samples. We did not have RNA or protein available for these samples to examine SOX7 expression. The downstream region (-71 to +251) was neither methylated in NSCLC nor matched normal samples (Figure 4D), which was consistent with the methylation pattern noted in the NSCLC cell lines. Methylation analysis of upstream regions of SOX7 gene . (A) Schematic illustration of CpG sites spanning 1,500 bp upstream and 350 bp downstream of the transcription start site of SOX7 transcription. Black arrow denotes the transcription start site (+1). Vertical pink bars denotes the CpG sites. Arrowed bars define the regions subjected to bisulfite sequencing (BS). Bars with circles at their end define the regions subjected to methylation specific PCR (MSP). (B) Bisulfite sequencing of SOX7 gene in NSCLC cell lines. 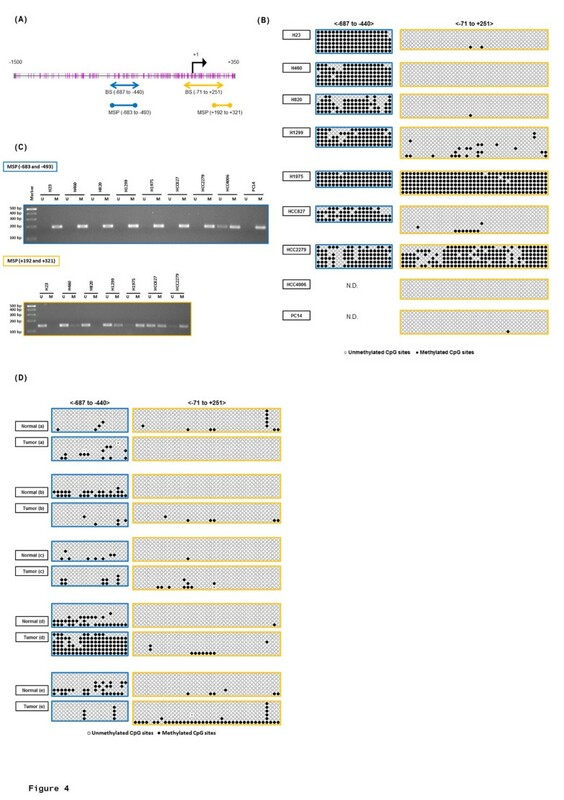 Each circle in each horizontal row represent the analysis of a single clone of bisulfite-treated DNA encompassing either 20 or 35 CpG sites (-678 to -440, left panels; -71 to +251, right panels, respectively). Open and solid circles represent unmethylated and methylated CpG sites, respectively. 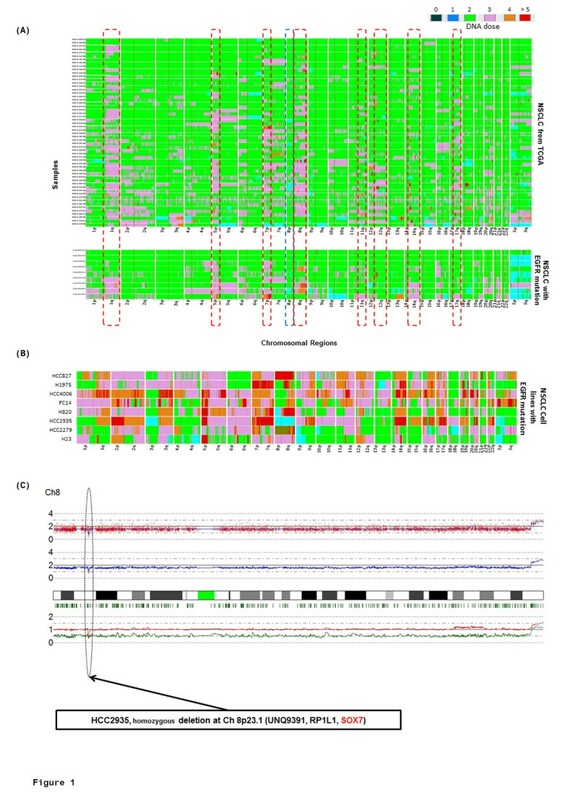 (C) MPS analysis of upstream region of SOX7 gene in NSCLC cell lines. PCR products in lanes marked “U” and “M” are obtained with unmethylated-specific and methylated-specific primers, respectively. 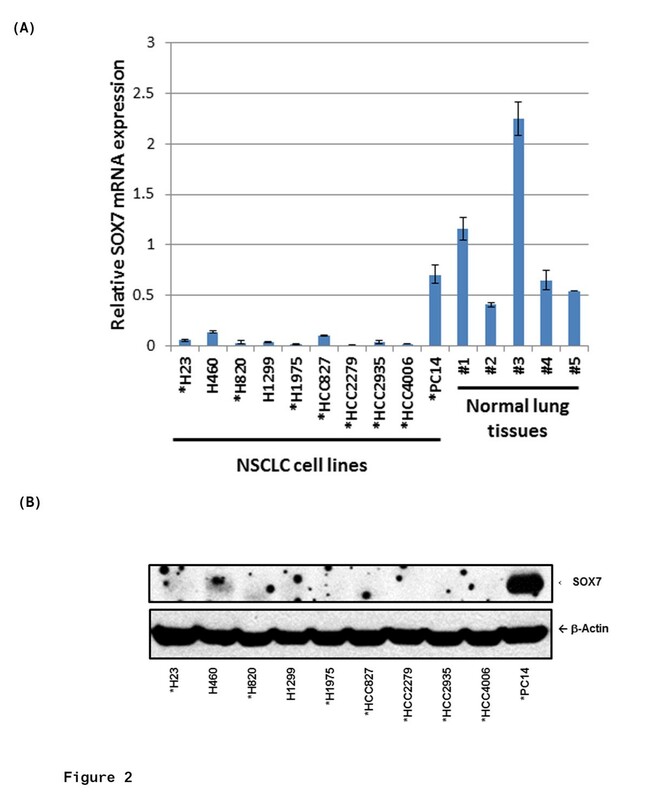 (D) Bisulfite sequencing of SOX7 gene in NSCLC samples and their matched normal lung tissues as described for the NSCLC cell lines in Figure 4B. -, +/-, ++: no, slight, moderate SOX7 protein expression. BS, Bisulfite sequencing; MSP, Methylation specific PCR; U, Unmethylated; M, Methylated; N.D., Not done. We developed stable clones of three NSCLC cell lines (H23, H1299, H1975) expressing a SOX7 expression vector (Figure 5A). These NSCLC cells had statistically significantly slower growth than the vector control cells (H23 and H1975, p= < 0.001 and H1299, P=<0.01, respectively) (Figure 5B). Forced-expression of SOX7 slows NSCLC proliferation . NSCLC cell lines (H23, H1299 and H1975) were stably infected and selected for stable expression of SOX7. (A) SOX7 vector uninfected (WT), GFP expression vector infected (GFP) or SOX7 expression vector infected SOX7 cells were confirmed in the three NSCLC cell lines by western blotting. β-actin was the control for equal loading. (B) Proliferation was measured by MTT assay. Each cell line was seeded in 96 well plates and absorbance was measured after 1, 2, 3 and 4 days culture. Results show the mean ±SD of quintuple wells. ** or ***, signifies statistical differences p < 0.01 or p < 0.001, respectively. To study the effect of SOX7 expression on the cell cycle, we used H23 and H1299 human lung cancer cell lines stably expressing either SOX7 or GFP (used as control). 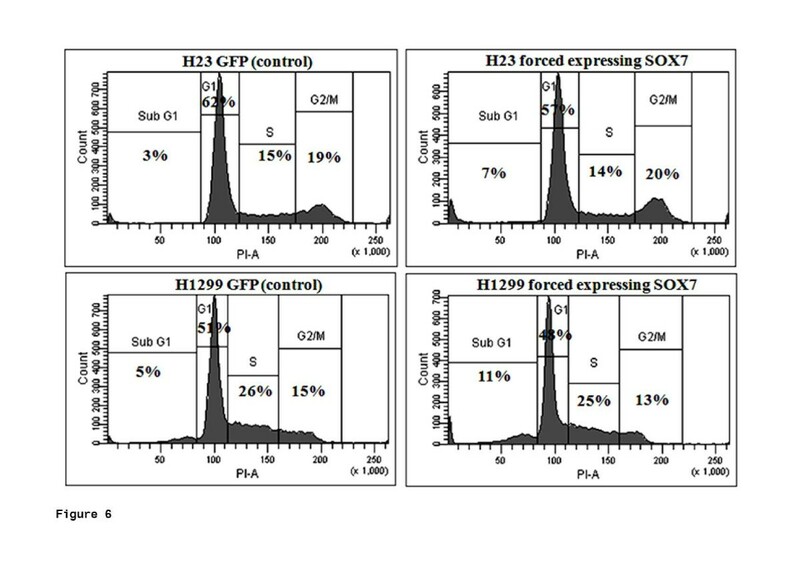 Fluorescence-activated cell sorting (FACS) analysis for the cell cycle showed that forced expression of SOX7 in H23 and H1299 cell lines resulted in an accumulation of a sub-G1 peak compared to the control cells. The percentage increase in the sub-G1 phase was from 3% (control) to 7% (SOX7) for H23 cells and 5% (control) to 11% (SOX7) for H1299 cells. The proportions of cells in the other phases of the cell cycle were generally unchanged in experimental versus control cells. 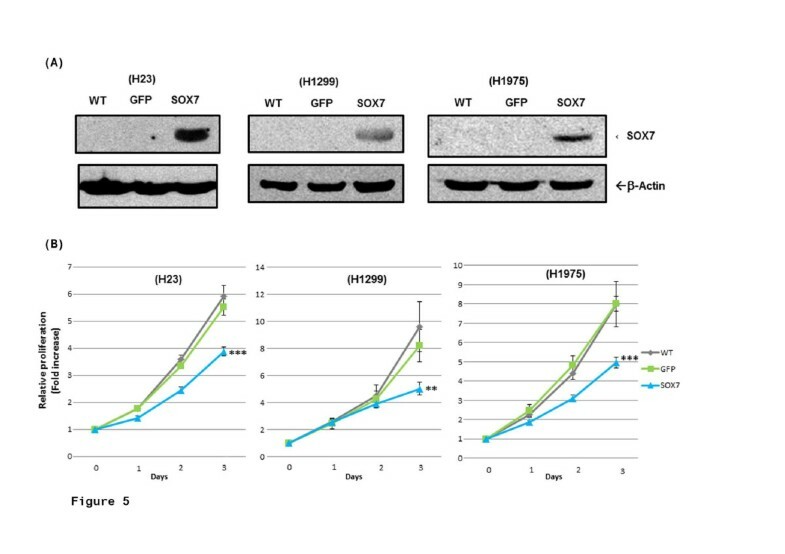 These results demonstrate that SOX7 forced expression in lung cancer cell lines was associated with a sub-G1 population which probably reflected apoptosis (Figure 6). Forced-expression of SOX7 increases subG1 phase of cell cycle in NSCLC . Histogram represents the distributions of cells (H23 and H1299) in sub-G1, G0/G1, S and G2/M phases as determined by flow cytometry. Forced expression of SOX7 resulted in increased percentage of cells in subG1 phase of cell cycle in H23 and H1299 compared to GFP (control) cell. The figure is the representative of three independent experiments. 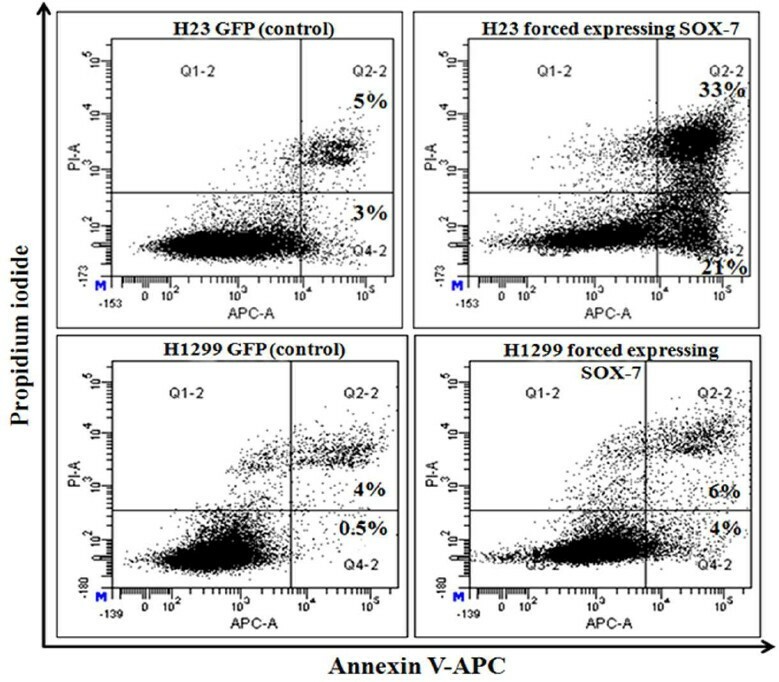 To explore further whether forced expression of SOX7 resulted in apoptotic cell death, Annexin V-APC/propidium iodide (PI) staining was performed for H23 and H1299 human lung cancer cell lines stably expressing either SOX7 or GFP (used as control). Based on Annexin V and PI staining, SOX7 expression led to increased early (AV+PI-), as well as, late (AV+PI+) apoptotic cells. A notable 21% and 33% of the H23 SOX7 cells were early and late apoptotic cells, respectively. In comparison, 3% and 5% of the H23 GFP cells (control cells) were early and late apoptotic cells, respectively. Less dramatically, 4% and 6% of early and late apoptotic H1299 SOX7 cells, respectively compared to 0.5% and 4% of early and late apoptotic H1299 GFP cells (control), respectively (Figure 7). Forced-expression of SOX7 increases apoptosis in NSCLC by Annexin V-PI staining . Flow cytometry profile represents Annexin V-FITC staining in X-axis and propidium iodide in Y-axis. Dual staining of cells with Annexin V-APC and propidium iodide enabled categorization of cells into four regions. Region Q1 shows the necrotic cells, Q2 shows the late apoptotic cells, Q3 shows the live cells and Q4 shows the early apoptotic cells. 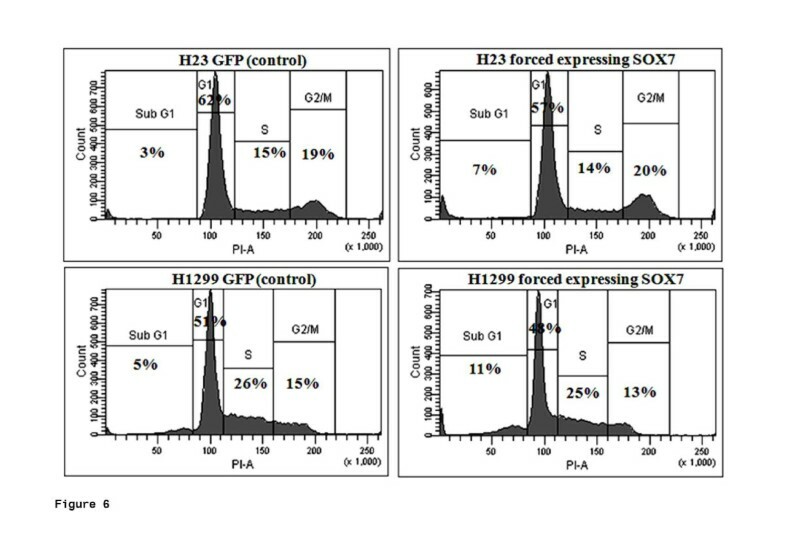 Forced expression of SOX7 resulted in increase of early and late apoptotic cells in H23 and H1299 compared to GFP (control) cell. The figure is the representative of three independent experiments. We initially performed CN analysis of 9 NSCLC samples and 8 NSCLC cell lines, each with an EGFR mutation. Their pattern of genome alterations were compared to the SNP-Chip copy number changes found in 56 NSCLC in the TCGA data base. Our samples were from non-smoking Asians who had EGFR mutations. The TCGA samples were composed of predominantly Caucasians who smoked and therefore less than 7% of samples would be expected to contain an EGFR mutation . Remarkably, their genomic landscape of copy number change was very similar. All the samples had increase in CN throughout the genome (predominantly 3N), especially at 1q, 5p, 7p, 8q, 11q, 12q, 14q, 17q. However, although sample numbers were small, eight genome regions had notable difference in copy number changes between the NSCLC samples with EGFR mutation compared to those in the TCGA data base samples (Table 2) including 1p36.31-36.32 [8/9 (89%) versus 15/56 (27%)] and 19q21.3, [5/9 (56%) versus 6/56 (11%)], respectively. Further studies are required to clarify what the target genes are in these regions (Table 1). One of the NSCLC cell lines (HCC2935) had a homozygous mutation at 8p23.1 which encompassed the SOX7 gene (Figure 1). Interestingly, 8p is one of the few regions in the NSCLC samples associated with deletions. Homozygous deletion usually represents the loss of a tumor suppressor gene deleted by the tumor. Our further studies focused on SOX7. Expression levels of SOX7 mRNA and protein were diminished in eight of 10 NSCLC cell lines (Figure 2), as well as in fifty-seven of 62 (92%) NSCLC patient samples compared with their matched normal tissues. Expression level of SOX7 in NSCLC samples was correlated with their histology, with levels being lower in adenocarcinomas compared with adenosquamous and squamous carcinomas (Figure 3). Furthermore, force-expression of SOX7 in several NSCLC lines (H23, H1299, and H1975) having constitutively low level of SOX7, suppressed their cellular proliferation and enhanced their apoptosis (tested with H23and H1299) (Figure 5, 6 and 7). Recent studies of SOX7 in colorectal and prostate cancers showed that levels of this transcription factor were low in these cancers in part due to aberrant DNA methylation of the gene, and the protein behaved as a tumor suppressor gene in these cancers [10, 15]. We found that the upstream region (-687 to -440) of SOX7 was highly methylated in eight of 10 NSCLC cell lines (Table 3). Paradoxically, expression of SOX7 and methylation as measured by MSP analysis were not correlated in the H460 and PC14 cells, and only one of 5 fresh NSCLC samples was highly methylated in the promoter region of SOX7. This suggests that additional epigenetic changes are required for silencing of this gene in a proportion of NSCLC. In summary, our study suggests that SOX7 is a tumor suppressor in the lung. One or occasionally both alleles are lost in the lung cancer. Other times the upstream CpG island of the SOX7 gene is robustly methylated, associated with low expression of the gene. SOX7 levels were nearly undetectable in seven of 9 (78%) highly methylated NSCLC cell lines, and levels were low in 57 of 62 (92%) NSCLC samples compared to adjacent normal tissues. Loss of SOX7 expression appears to provide a growth advantage to NSCLC cells. This work was funded by the Singapore Ministry of Health’s National Medical Research Council under its Singapore Translational Research (STaR) Investigator Award to H. Phillip Koeffler, and NIH grants R01CA026038-32, as well as, the Cancer Science Institute of Singapore internal grant awarded to Patrick Tan. We are grateful to Dr. Eng Chon Boon (Head of NUH-NUS Tissue Repository) and his team who provided DNA and total RNA of normal and cancerous lung tissue. TH, MG and DY conceived and designed the study, performed the interpretation of data, literature search and writing. MS, NK, SS, WC and LWD performed statistical analysis and data interpretation. GL carried out analysis and writing. SM and DX performed patient collection and clinical data interpretation. PT participated in the study design. HPK conceived and designed the study, carried out data interpretation and analysis, and writing. All authors read and approved the final manuscript.